A major health issue related to diabetes is constricted circulation, especially in the legs and feet. Injury there or undue pressure on skin, muscles and nerves can cause irreparable damage. 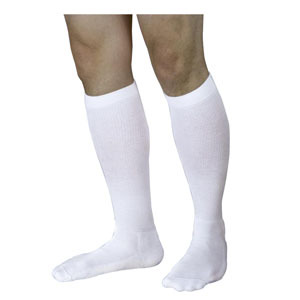 Diabetic socks use mild compression to promote better blood flow and provide additional cushioning to help prevent injury. Diabetic shoes are designed to provide optimum support and minimize rubbing and potentially unhealable blistering.